The Pokémon universe has produced over the years countless pocket monsters and generations of them. In the AR app Pokémon GO you can catch them all. Here are Water-type Pokémon tend to be found on lakes and Grass Pokémon in parks. Where you can find all Pokémon types in Pokémon GO, we will show you below. Special or rare Pokémon spawn in places like Mount Everest, but also you'll be able to catch a rare monster on a lake or a cave. You go search specifically for your favorite Pokémon, you should also know what Pokémon types are weak or strong against others. 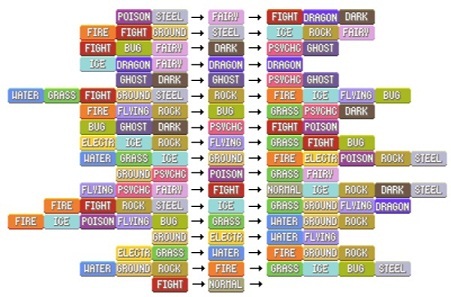 In the graph below you see how Pokémon types are related. Below you can see the locations of all Pokémon types. But when we tried Pokémon GO, we noticed that they don’t work strictly - for example you can find Flying Pokémon in the grass. Borders, spaces, agricultural land / fields, roads, schools, shops, railway lines, sidewalks, hotels, main roads, secondary roads, libraries, walkways, sports facilities, recreational areas, school, gym, stadium and universities. Landmass, farms, farmland, courtyard, forest, gardens, golf courses, grass and meadows, nature reserve, parks, roads, playgrounds and residential areas. Points of interest (landmarks, famous vacation places), cemetery, churches and other religious buildings.